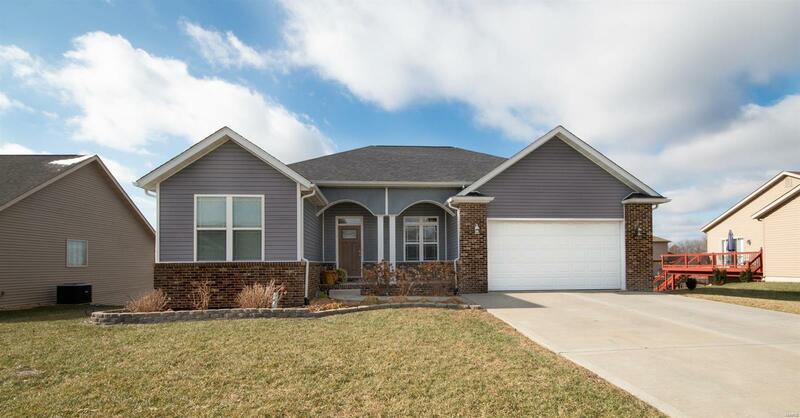 ABSOLUTELY STUNNING home finished w/all of the most popular finishes! 2nd Kitchen in walk-out basement w/ new black stainless appliances (including wine fridge) + wet bar. Upstairs finish is gray, white base & doors, brushed nickle hardware. Open concept living, dining & kitchen. DOUBLE OVEN, stainless, granite counters, under mounted farm sink, staggered height cabinets w/ crown & huge island. 11' entrance and 9' ceilings w/ hand scraped floors throughout the main. Living room has gas fireplace & large windows. Dining has sliding doors to beautiful covered deck (ceiling fan) overlooking fully fenced yard. Master bedroom is BEAUTIFUL with walk in closet, picture window and scraped floors. Master bath with claw foot tub, double vanity, built in dressing station, shower and powder room. Split ranch has 2 additional beds on main. Basement features has wet bar, 2nd kitchen, family room, storage and 4th bed, 3rd bath. This home is BELLISSIMA! O' Fallon Schools. Great location!